The Geology of Georgia field guide supports dynamic content and provides users with experiences that require no additional learning curve. Lacking a legislative mandate that would afford reliable funding, the Georgia Geologic Survey was abolished in 2004 after serving the state for 168 years. Because state geologic surveys provide scientific, economic, and educational functions, they are generally considered a fundamental element of state government. Recently, samples collected by a state geologic survey were used to verify mineral deposits for commercial mining operations, while work by the survey in another state precipitated an investigation into a natural gas seepage through fractured bedrock that resulted in a series of dangerous explosions. When the Georgia Geologic Survey was abolished, its extensive collection of minerals, core samples, fossils, geologic maps, historical documents, and ongoing research was widely dispersed throughout the state. Some of the materials were relocated to museums, schools, and storage facilities. However, a significant portion was either lost or discarded due to a lack of space. “The loss of Georgia’s Geologic Survey has created a real gap in the knowledge about the geology of our state,” said Katayoun Mobasher, an associate professor of geology at the University of North Georgia’s Institute for Environmental & Spatial Analysis. To try to narrow this gap, Mobasher began digitizing both old and new information about the state’s geology in a geodatabase. But she felt that she could do more to share this information widely and fill the increasing fissures of knowledge among geologists, geoscientists, and geology educators and students. And so, the interactive Geology of Georgia field guide was born. Presented as a story map, the Geology of Georgia field guide equips users with the tools they need to visualize rock samples and access detailed information about geologic sites quickly. Having gaping holes in knowledge about geology—and lacking a central organization through which this information flows—affects economic and social development, as well as education. “Geology is dynamic,” said Mobasher. “The processes that took place in the past to form our geology are still happening today, which provides us with important insight into our geologic, and potentially economic, future—particularly for those natural resources that are exploited commercially, such as crude oil, natural gas, and a variety of minerals. 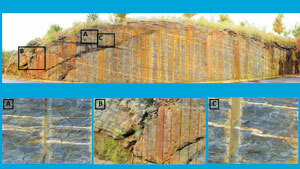 In addition, because state geologic surveys regularly publish information that can be used by geoscience researchers and educators, there was a lack of current information available that I could use in my geology classes”—especially for trips to the field, which are an important component of all geology classes. The 2013 publication of Roadside Geology of Georgia, by Dr. Pamela Gore and Dr. William Witherspoon, was welcomed by the geologic community, since it provided much-needed updates about Georgia’s geology. But it was only available in print. Mobasher wanted her students to be able to use their smartphones and tablets to access the guide in the field. She thought a field guide could also include links to additional information about each location. And she wanted to be able to make updates more quickly and foster greater collaboration. 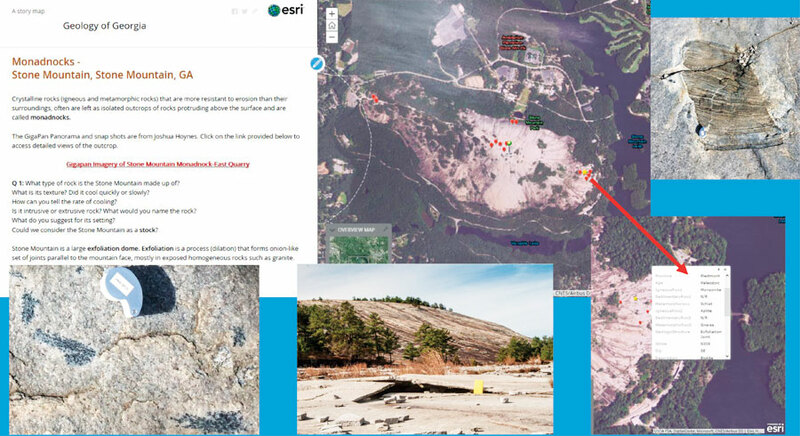 In 2014, Mobasher began developing a geodatabase by field verifying and digitizing the site information contained in the Roadside Geology of Georgia, as well as other field information about Georgia outcrops. She also examined the voluminous geologic reports, papers, and data related to the state’s geology. Her plan was to use this geodatabase to produce her digital field guide. Because Mobasher uses various ArcGIS software products to collect and maintain the geodatabase, she first attempted to produce a field guide with ArcGIS Online. But it didn’t provide the visual context she was looking for. So she turned to Esri Story Maps apps. Development of the Geology of Georgia field guide is an ongoing process. 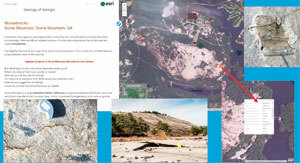 As researchers complete information about geologic sites around Georgia, Mobasher adds it to the guide. And because the guide is interactive, it provides directions on how to get to each site through Survey123 for ArcGIS or Collector for ArcGIS. Both professional and amateur geologists use the guide, as do geology students in both undergraduate and graduate classes. To help everyone get the most out of the field guide and further collective knowledge about Georgia’s geology, Mobasher has written challenging questions and included references from other geologists concerning the outcrops to promote speculation and analysis about them based on existing evidence. But building a geologic geodatabase for the entire state of Georgia is a complex and time-consuming project. To maintain its momentum, Mobasher is enlisting the help of the geologic community. One important aspect of the project is preserving the handwritten notes and sketches of retired geologists and geoscientists. Because the geology of Georgia is complex, there are sometimes different interpretations of outcrop formations. 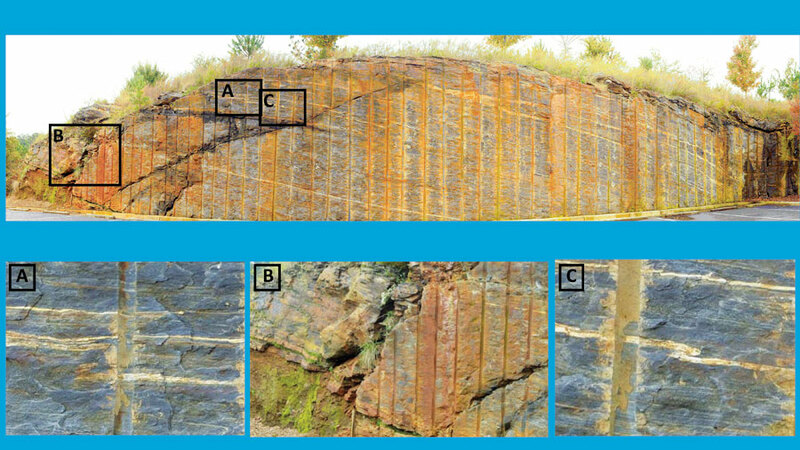 Gigapan photography of this rock outcrop in Duluth, Georgia, allows users to see all its faults, folds, and veins. It is sometimes difficult to examine outcrops closely in nature, even with binoculars. So Mobasher is implementing another new technology in the field guide: Gigapan, a special camera technology designed by NASA that takes tremendously high-resolution panoramic photos of a specific area. The Gigapan imagery, as well as the other photos, videos, sketches, and field notes Mobasher includes in the Geology of Georgia field guide, enables those students with physical limitations to participate fully in her classes by allowing them to take virtual field trips. Mobasher also plans to soon begin taking georeferenced images of the outcrops using ground control points with Drone2Map for ArcGIS. The data will be converted to 3D imagery for publication in the field guide. The field of geology is evolving, and Mobasher is designing the Geology of Georgia field guide to keep pace with that. Using a handheld X-ray fluorescence spectrometer, Hughart and Mobasher are going to perform chemical analyses of rocks, minerals, and soils in targeted locations to determine if their composition includes radioactive elements, such as uranium or potassium. “We want to ascertain if there is a link between the geology of certain areas and the health of the inhabitants,” Mobasher said. She will then make a story map of their findings. “I think that the story map format can make some scientific information clearer, which promotes collaboration and understanding,” she concluded. The Geology of Georgia field guide is made possible by the continuing support of the University of North Georgia through both its Institute for Environmental & Spatial Analysis and its Presidential Award program.